← Grandma and Grandpa are here! M likes wearing her big sister shirts. She likes reading her big sister books. 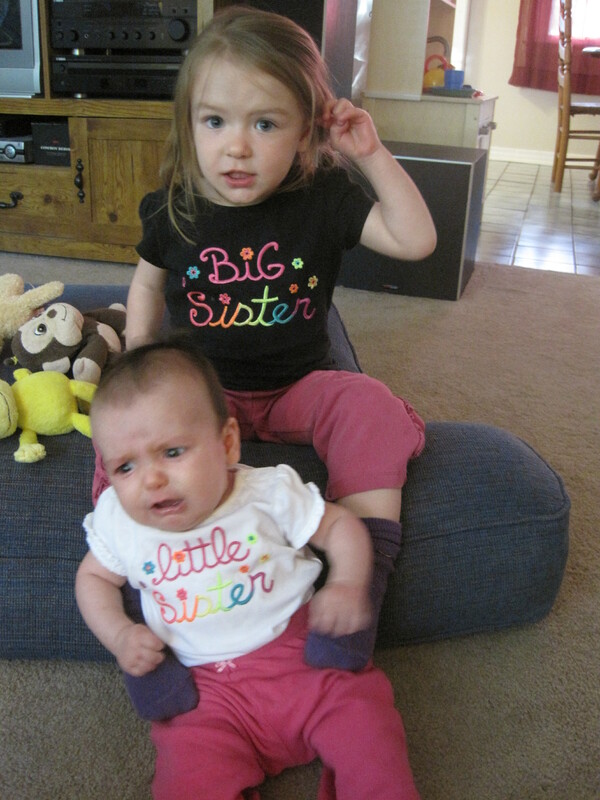 She likes her sister just fine. But most of the time she just goes on with life like her sister isn’t even there. Usually the crying doesn’t phase her, but sometimes she says things like, “S is not making good choices” and “S is not using her inside voice.” When I set the bouncy seat near her while she’s eating so S can watch her, she usually tells me she doesn’t want S to watch her. Overall I’d say she’s currently indifferent about a baby being part of our family now. But then, usually a couple times a week, she’ll walk over to S, kiss her on the head and say, “That’s my SEESTER.” As you can see, neither of them really loved posing for this photo. This entry was posted in Sisters. Bookmark the permalink.